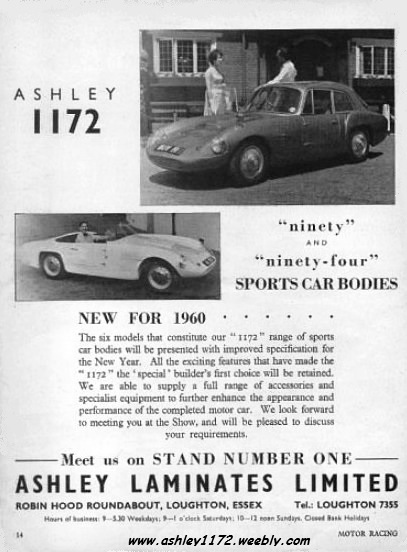 I have only seen this car in Ashley Laminates adverts that have appeared in motor magazines and "MOTOR SPORT" in the late 1950's and early 1960's also in their own inhouse adverts. 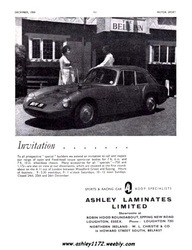 It is noted in the "The History of Ashley Laminates"
"One particularly noteworthy Ashley, an 1172 hardtop, was WUV 19 used by the Ashley Sales Manager. 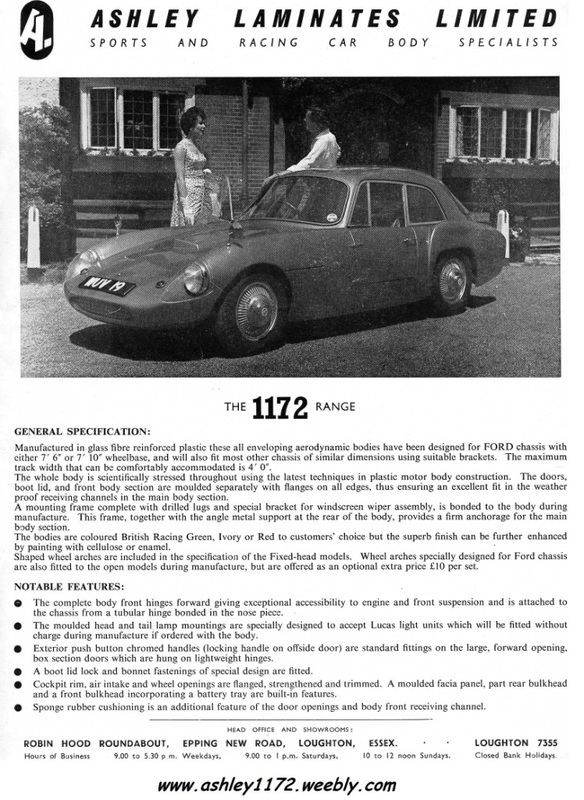 This had been finished to a very high standard with 'Metallic Blue' paint. 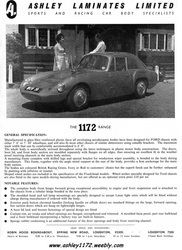 When a hardtop was supplied a rubber gasket was fitted between it and the rest of the body and this left a panel gap between the two, but in this cars case the gap had been filled. 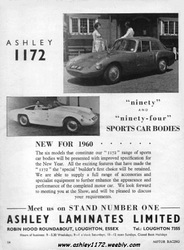 The car was usually on display in the showroom and used in contemporary advertising. A few years later the same car featured in a major tyre company’s national poster campaign. 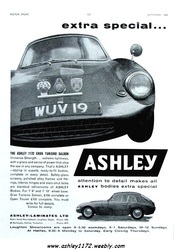 Also mentioned in the “The Amazing Sports Car Journal” by Jasper Wilkins (Peter Filby) who states "A good car was certainly a rarity, but one particularly nicely finished Ashley was built in 1959 with a tuned MGA 1600 c.c. engine, it was reputed to do over 130 m.p.h. 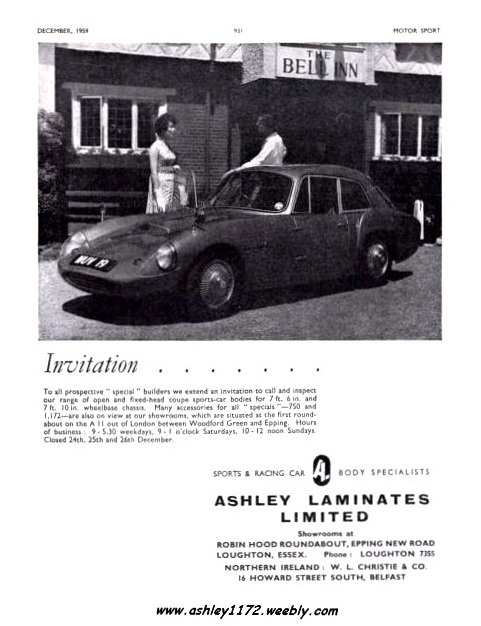 As can be seen in the above adverts the main photo was taken outside the The Bell Inn, Essex, (the early showroom and factory was located in Essex) the London registration was issued between February & November 1959. 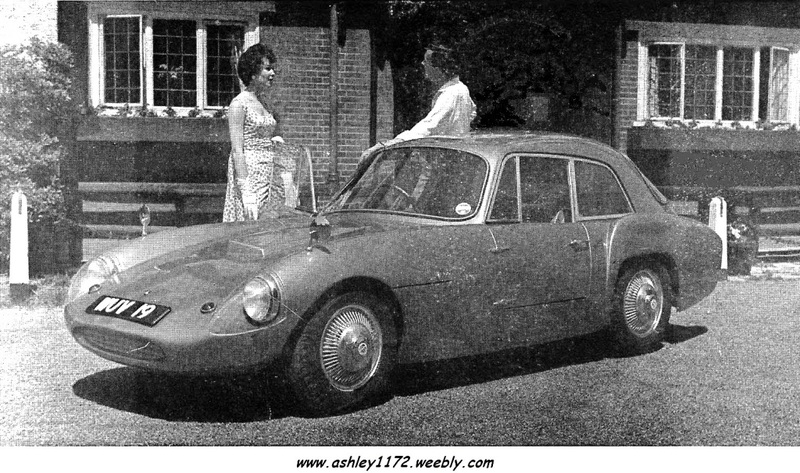 It's interesting to note that the doors had the early type up/down windows with quarterlite and not the later type slide windows, there must also have been a bit of a problem when it rained - no windscreen wipers. As always if anyone owned this car or still does or anyone has information about it, please do email me with the details so I can add it to this page.